By John F. McKenna (McJack): When World Boxing Council (WBC) heavyweight champion Vitali “Dr. Ironfist” Klitschko (42-2, 39 KO’s) steps into the ring on September 10 to face former cruiserweight and light heavyweight champion Tomasz Adamek (44-1, 28 KO’s) he will be facing a major dilemma. Vitali has been a dominant heavyweight champion since he came back from injuries in October of 2008 to stop Sam Peter who could not answer the bell for the 9th round. It was thought by many so called boxing experts that the “Nigerian Nightmare” would be too much for the 37 year old Klitschko, who had been inactive for four years. Instead Vitali easily dominated Peter who could not get out of the way of his left jab, short left hooks and crushing right hands. It soon became apparent that Vitali Klitschko had not lost a step during his years of inactivity. If anything Klitschko appeared to be better than ever upon his return to the ring. Vitali won nearly every round in the fight with Sam Peter. In the nearly three years since “Dr. Ironfist” returned to the ring he has won virtually every round of the seven fights he has had. Only Shannon Briggs and Kevin Johnson have managed to go the distance with Klitschko. Vitali Klitschko’s fights usually fall into a pattern, whoever his opponent may be. His opponent attempts to move in on the 6’7 ½” Ukrainian. Klitschko in turn makes them pay for every mistake with his ponderous jab and short brutal hooks. Usually by the middle to late rounds his opponent has been beaten down to the point where Vitali is able to land his punches at will and the end shortly follows. That is the scenario which almost all of Klitschko’s fights follow. Vitali is a chess player both inside and outside of the ring. You can almost see the wheels turning inside his head as he slowly dismantles his foe. He makes the determination as when to up the ante and end the fight. Viali likes to give his adoring fans in his adopted country of Germany their moneys worth. Last March when Odlanier Solis challenged Klitschko things did not go quite the way Vitali had planned. Again you could see the wheels turning as Solis moved in and Klitschko allowed him to land a couple of ineffectual shots. Klitschko began to time Solis as he moved in and landed a shot to his temple which stunned Odlanier, after which he crumpled to the canvas. 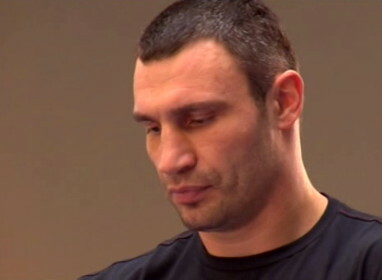 To say that Klitschko was embarrassed at Solis’ performance would be an understatement. When Solis did not get up again Klitschko showed his disdain for him, not unlike Cassius Clay’s reaction when Sonny Liston went down in the first round in 1964 and did not get up again. The dilemma that Klitschko has is that on the one hand he wants the fight with Adamek to be entertaining. He wants the fans to get their moneys worth, which the fans at the Klitschko – Solis fight did not get. Even though this fight is in Poland and not before his adopted German fans, Vitali would like to put on a show. When Klitschko fought Albert Sosnowski in 2010 it was pretty clear that he could have ended the fight sooner than he did. It appeared to some fans as though he had allowed the fight to go a couple of extra rounds. The problem Vitali has in his fight with Adamek is that much like David Haye’s fans in the UK, Tomasz’ Polish fans are extremely passionate. Adamek is a hero in Poland and fans there think he has a real good shot at winning. If Vitali does not KO Adamek or beat him decisively he runs the risk of losing a decision in the enemy camp. For that reason Klitschko needs to take Adamek out and protect his title. Boxing judges are under many influences, not the least of which is a passionate crowd.